What this is for: Guidance to assist state and local health departments, acute care hospitals, and other emergency care settings (including urgent care clinics) in developing preparedness plans for patients under investigation (PUIs) for Ebola virus disease (EVD). This guidance does not address Ebola preparedness for primary care offices and other non-emergent ambulatory care settings. Guidance for these settings can be found in Identify, Isolate, Inform: Emergency Department Evaluation and Management of Patients Under Investigation for Ebola Virus Disease[PDF - 1 page]. How this relates to other guidance documents/purpose: This guidance serves as an overarching framework for three other specific CDC guidance documents: Interim Guidance for Preparing Frontline Healthcare Facilities for Patients Under Investigation (PUIs) for Ebola Virus Disease (EVD); Interim Guidance for Preparing Ebola Assessment Hospitals; and Interim Guidance for Preparing Ebola Treatment Centers. Whereas every state is not obligated to adopt a three-tiered approach, all states are strongly encouraged to identify Ebola assessment hospitals that can successfully manage PUIs until an EVD diagnosis is either confirmed or ruled out while awaiting transfer to an Ebola treatment center. All U.S. acute healthcare facilities have an important role in preparing to identify, isolate, and evaluate PUIs for EVD and promptly informing public health authorities. However, the roles and the preparations required to perform these tasks will differ by facility. 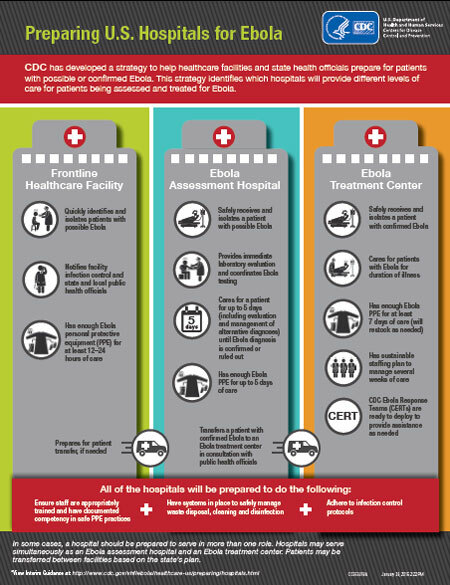 Acute healthcare facilities can serve one of three roles: as a frontline healthcare facility, Ebola assessment hospital, or Ebola treatment center (see Figure). In some cases, a hospital may be prepared to serve in more than one role. Some hospitals may serve simultaneously as an Ebola assessment hospital and an Ebola treatment center. State and local health ‎officials, in consultation with healthcare officials in hospitals and urgent/emergency care settings and emergency medical services providers across the state, should develop a concept of operations plan that describes a networked approach to the evaluation, care, and testing of PUIs , including specific plans for the transfer and treatment of patients with confirmed EVD. As part of Ebola hospital preparedness efforts, hospital officials should develop an internal communications plan to ensure that information is shared in a coordinated way if the facility needs to care for PUIs. An external communications plan to effectively communicate with media, partners, and others should also be developed. To create a coordinated, networked approach, state and local health officials, in collaboration with hospital executives, may identify healthcare facilities across the state to serve in one of three suggested roles outlined in this guidance document. Whereas every state is not obligated to adopt a three-tiered approach, all are strongly encouraged to identify Ebola assessment hospitals that can successfully manage PUIs or confirmed cases of EVD until an EVD diagnosis is ruled out, especially in states where there is not expected to be an Ebola treatment center. This is particularly important in states where there is not expected to be an Ebola treatment center. Designating assessment hospitals helps to ensure that PUIs have in-state access to care while awaiting transfer to an Ebola treatment center.